For the first time in the country’s history, Georgia’s Cadet Military Lyceum has received female cadets. Since its opening, Georgia’s Cadet Military Lyceum has become the country’s top secondary military education institution, however, until now, the school has only accepted males into the academy. President Giorgi Margvelashvili visited the Lyceum and congratulated students all over the country on the first day of the school year, especially welcoming the first female cadets. According to the President, education guarantees the progress of each student and is the foundation of strength and unity in the country. "I want to congratulate the entire country on this day, the beginning of the academic year. This Lyceum is a special educational facility and it has made special contributions to our country's development and progress,” said Margvelashvili. According to him, traditionally Georgian women have always stood beside Georgian men to protect their country. “I want to address everyone, to our friends and foes, that our country is powerful. It is powerful with its past, present and future,” the President claimed. 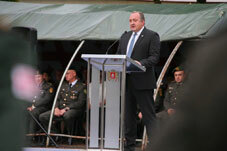 Moreover, Margvelashvili announced that he had established a scholarship for female cadets to encourage more young women to learn at the military lyceum. “I want to thank all the teachers, professors, officers and cadets who are strengthening our homeland,” he added. 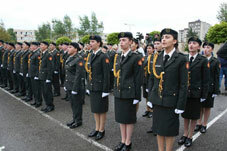 Georgia’s Cadet Military Lyceum was established in 2010. From now on, male and female students who have completed nine grades at school, will able to enter the lyceum and undertake a three year course of military study and training.